Happy New Year 2016. This is my first post of 2016 and I hope i will be back to my normal blogging schedule soon. Today, I am reviewing rectangular stamper holder and 5pc stamper head refills from Born Pretty Store. Please continue reading to know about this product. This set has one rectangular holder and 5 colorful squishy stamper heads. 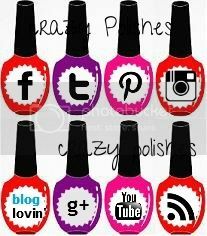 You can put whichever stamper head you like and go on with your nail art stamping. The stamper heads comes in five colors: translucent, lime green, baby pink, blue and red. The stamper heads are squishy soft. I wont say that these are as squishy as marshmallow stamper heads but yes quite comparable. These stampers are shiny with some sticky residue on. I tried stamping with them as it is but they didnt work well, only a few parts of image picked up. Then I buffed the stamper head with my glass file till all the shine goes off. After that I rolled it over a lint roller to remove the residue. I stamped again and image picked up great. So yes these stamper heads need buffing but only a little till the shine goes off. For the stamping test I used BPS- L016 stamping plate and konad black and white stamping polishes. Overall I like these stampers. If you are looking for rectangular squishy stampers then these are a great choice without a doubt. These are great if you want to make stamping decals. Only thing to keep in mind is to do gentle buffing because i damaged one stamper head while buffing, though its tini tiny. You can buy this stamper set from Born Pretty Store website. This set costs $8.51 but currently its on sale for $3.99. 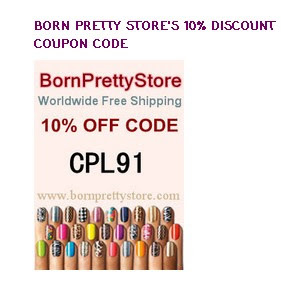 You can get 10% off by using code "CPL91".